The Brood is pressing their advantage. The base is starting to crumble. NorTec bodies litter the ground. The transport ships are on their way, but who will make it to the Xenosathem first? Time is of the essence, delaying could mean tragedy. 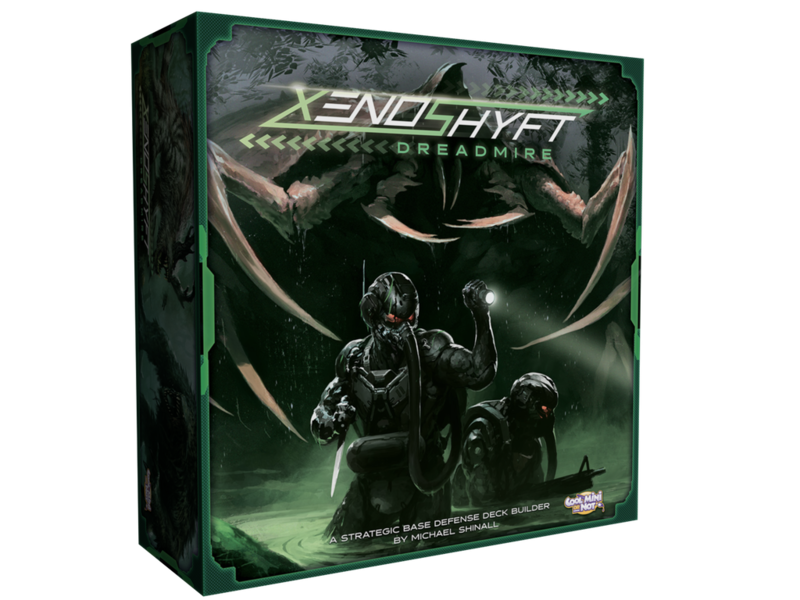 The final hours of XenoShyft: Dreadmire up on Kickstarter are upon us. You only have until 3pm (Eastern) today to pledge. As you can tell from that tiny graphic there (click on it to see the full-size version, of course), there's lots and lots of extra things that have been added to the core pledge. There's literally dozens of extra cards, with all sorts of Kickstarter exclusive gear and monsters, there's a play board, there's oversize location cards. Then there's the add-ons in the form of lane boards, playmat, and two expansions: Forbidden Sciences and the bigger Xenoshyft: Immolation expansion. There's a little bit of everything going on. But as I mentioned, it's only going on for another 5 hours (at time of posting), so be sure to get in before the getting is gone.